It’s the middle of the night and the phone rings in one of Air Methods’ 300 base locations across the nation. There’s been a major highway accident, and one victim clings to life as first responders provide medical assistance. Air Methods’ team quickly joins the rescue effort. The pilot checks the weather and readies the helicopter. As he does so, a flight nurse and medic jump on board, and together they fly to the accident scene. En route, they stay in constant communication with a control center that advises the most direct flight path. They land in the middle of the highway, load the patient, and continue providing emergency medical care as they travel to the nearest level one trauma center. For Air Methods, it’s all in a day’s work. With a fleet of more than 450 owned and leased aircraft, the publicly traded corporation is the world’s leading provider of air medical services. Their bases operate around the clock with medics and pilots ready to provide elite medical care at a moment’s notice. Crystal Gordon is Air Methods’ general counsel and corporate secretary. A Denver native who attended law school at the University of Denver, Gordon got her start in private practice working in mergers and acquisitions, SEC compliance, securities offerings, and corporate governance for two large firms. Now she’s leading a team of five in-house lawyers who navigate the complex legal world that keeps Air Methods in the sky. 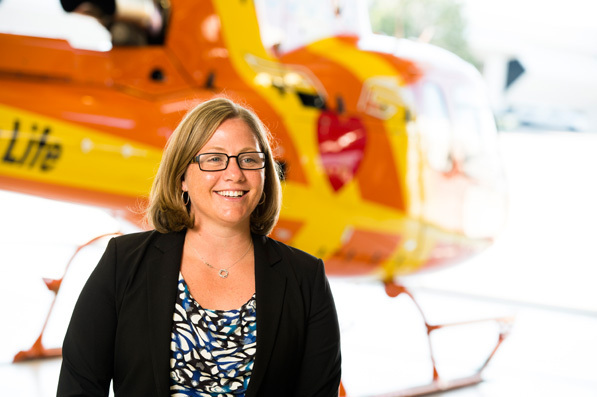 “We have two very large areas of law that we deal with, because we are subject to the regulatory framework of health care and aviation,” she explains. “And then we also deal with life as a public company.” Gordon spends much of her time following pending legislation and regulations while working closely with government affairs and tracking the evolution of health care to see what’s coming down the line. Her internal team includes two health-care and regulatory lawyers, an M&A and corporate lawyer, an employment/labor lawyer, and a general contracts lawyer. Gordon says her team works closely with the business on all strategic decisions, and to do so, they must work to stay as up to date as possible. “We really have to stay proactive and look around the corner to predict where health care will be in the next several years, because that will determine how the company operates,” she says. As the Affordable Care Act continues to change the way hospitals provide and patients receive health care, third-party companies like Air Methods are left without certainty. Thus, Gordon and her colleagues are analyzing several alternatives and planning for a handful of most-likely scenarios. Among the many changes that the Affordable Care Act may drive, Gordon expects payment models to move to a quality-driven reimbursement structure. Air Methods is already measuring quality and outcomes, which currently drives training initiatives for clinicians across the company. In the meantime, departments across the organization are working to provide quality care no matter what comes their way. Recently, Air Methods—with a fleet larger than many commercial airlines—implemented some groundbreaking safety initiatives. Standard helicopter safety systems at Air Methods include night-vision goggles, GPS units, and satellite tracking. In 2013, the company became the first helicopter operator to achieve the highest level in the Safety Management System implemented by the Federal Aviation Administration. Additionally, clinical crews completed more than 243,000 hours of hands-on online and simulation training. Another trend Gordon monitors is the consolidation of hospital systems and the development of accountable care organizations. Gordon and her colleagues attempt to also “shape regulation to the extent they can,” she says, by meeting with various policymakers in Washington, DC. Leading her agenda is a focus on reimbursement for patient transports. “The cost to operate hundreds of bases around the clock under all the safety measures makes air medical services an expensive endeavor and requires a certain level of patient transports at each base to recoup such costs,” says Gordon. The demand for access to this emergency life-saving service is high. As such, bases provide nationwide access for patients in rural areas that can’t otherwise reach hospitals during life or death situations. The legal team is closely tied to the business and is invited in early when the company is making big decisions or trying to understand an issue. Gordon has worked hard to learn all aspects of the business and become a trusted advisor. “You can’t do your job as a general counsel if you don’t fully understand what the business is doing,” she says. “You’re just not effective.” An in-house lawyer has to be able to communicate, and for Gordon, that comes from experience in private practice and soccer, which she credits with giving her the emotional intelligence and leadership skills necessary to thrive at Air Methods. A good lawyer, she says, should learn to listen well and “stop acting like a lawyer for a little bit.” Once the issue is understood, an effective general counsel will apply the necessary legal expertise to mitigate risk and maximize the company’s business objectives. Health care is changing, which means every organization touching it in any way is changing, too. Despite the challenges associated with uncertainty, Air Methods has to continue its mission of getting patients the care they need as quickly as possible. By understanding the business and interpreting the regulatory changes, Gordon and her legal team are putting the company in a position for continued growth.